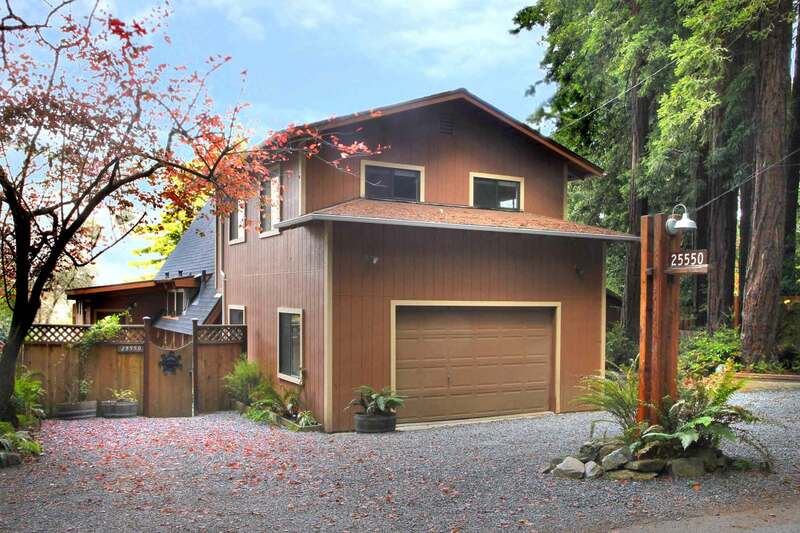 Spacious, Charmingly Updated Riverfront Chalet, Epic River & Mountain Views, Hot Tub, Fenced Yard, Lawn, *Seasonal Private River Access & Boats; Short Drive to Duncans Mills, Coast, Wine Tasting, Golf, Hiking, Redwoods. Wi-Fi; Unlimited Domestic Long Distance, Cable TV. Keyless Entry. Your Well-Behaved Dog is Welcome!! On the ground level, the kitchen is open to and up a few steps from the living room. On the far side of and open to the kitchen, there's a semi-formal dining area, and a bathroom off the dining area. On the upper level, three bedrooms and a bathroom are off a common lounge area. 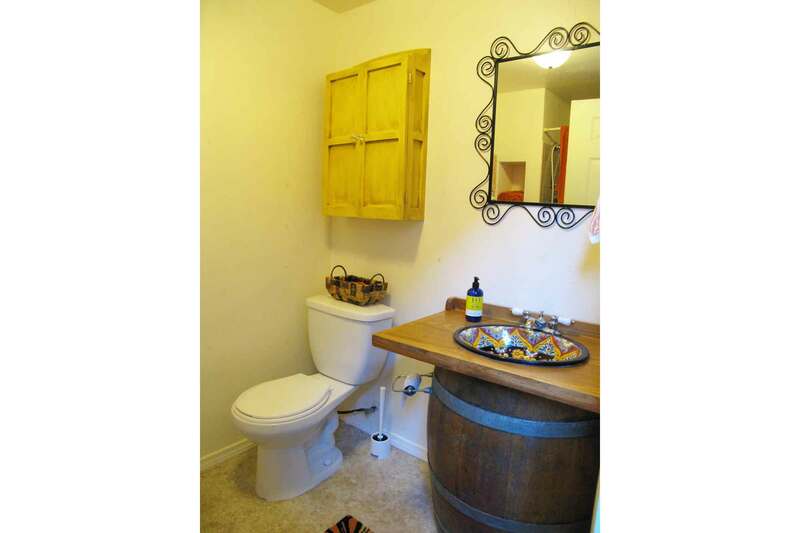 There's a free-standing full bathroom, just a few steps from the garage side door, which is just off the dining area. 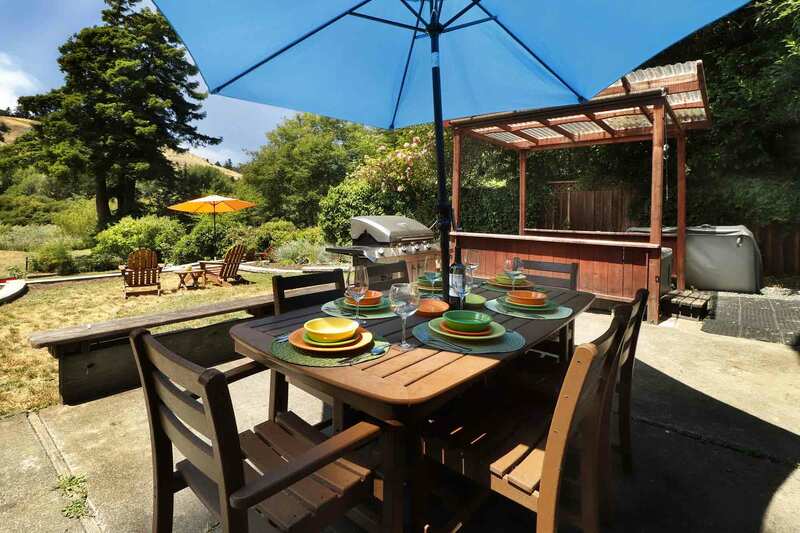 At the rear of the house, there's a large, fully fenced yard with lawn, dining patio and hot tub. Beyond the yard, there are steps to the *seasonal river access. The house is approximately 1650sf. Please note that the steps to the upper floor are steeper than average. Central Heat, Pellet Stove (living room). NO A/C. Short Drive to Coast, Wine, Redwoods, Golf. Please bring your own spa/beach towels and toiletries. "Nice quiet spot on the river"
Nice quiet spot on the river. Local Duncan Mills grocery store is a nice touch. We made several runs there during our stay. Do expect zero cell coverage before arriving. Especially those who rely on GPS only. We really enjoyed our stay here. It was such a peaceful setting with plenty of room to spread out to enjoy as a group, or hide away to snuggle up and read a good book. We loved our stay so much that we booked an additional night. The view is amazing and the house had everything we needed. We are already planning our trip back. Thank you! We enjoyed a quiet and beautiful New Year's at this property. The beds were super comfy and the hot tub was great for chilly winter afternoons. "This is a very nice rental." This is a very nice rental. Well stocked kitchen, very comfy tempurpedic beds in all rooms. The views are amazing. The house is a bit worn in terms of flooring and some key furniture but hopefully owners will address that. We had a wonderful time hiking in the area and there are great trails accessed from the house. What a great place for a larger group. We had a full family holiday visit and cooked many meals in their well-equipped kitchen. We really enjoyed quick trips to teh coast for beach walks and hikes in the surrounding hills. We also enjoyed the local bakery in nearby Duncan Mills.
" The house is very cute and picturesque. " Thank you for hosting us! The house is very cute and picturesque. We brought our dogs and they had a great time in the yard. If you are looking for a nice off-the-grid weekend getaway, this is the place. Low key. Right on the water. 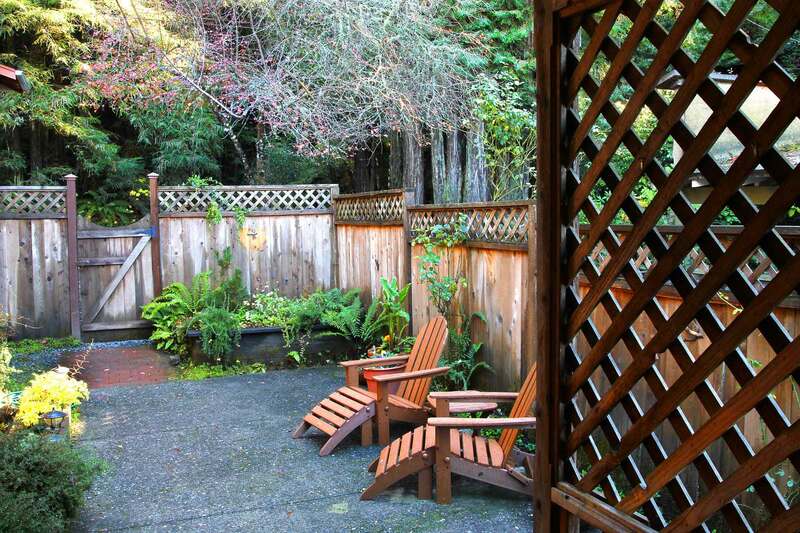 Easy to get to the coast or drive into Guerneville. Great amenities. Nice property. Comfortable bedding. Attentive property management. Kayaks. Super close to Duncan Mills, where I would recommend the Cape Fear Cafe, and the Gold Coast Coffee & Bakery, but not the Blue Heron, at least not for the food. "This place is so great, especially if you have a dog!" This place is so great, especially if you have a dog! Our dog woke us up every morning when the sun came up because she was so excited to play around in the backyard. It was like Christmas morning for her - haha! The yard is fully fenced too so we didn't have to worry about her, it was so great! The location is superb and it's nice to have access to the canoes on the river and then the hot tub at night. We'll definitely be back. What a beautiful spot! The house was quite comfortable and cozy, the yard and views were stunning, and we were pleasantly surprised to find a well equipped kitchen. Communication was easy throughout. We’re already looking forward to booking again. 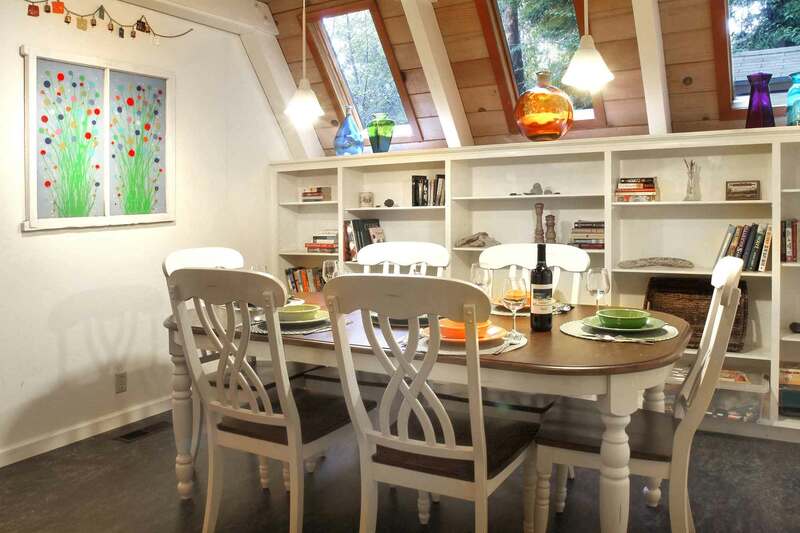 Stunning location and the home was so cozy with all the amenities we needed for a wonderful stay by the river! My family just wrapped up a fantastic stay. The house was a ton of fun for myself, husband and two children. The location was fabulous and we definitely plan on returning! Not only was the house and location amazing, but we had a very minor hiccup and the property management company was so quick to respond and resolve that we could not believe it. If we were unable to book this one in the future for some reason (we absolutely plan on going back!!! ), I would look to the same company to find another house as the customer service spoke volumes! Thank you so much for having us! PS - for those with kids and/or dogs, the fenced in yard actually allows you to relax.. at least momentarily! "We had a fun time"
We had a fun time. It was a nice place and the weather was very beautiful while we were there. "We loved our stay and will definitely be back"
We loved our stay and will definitely be back. It was beautiful, serene, full of sun, and everyday was the best day! Ha! Feeling super grateful, rejuvenated, and just a tad sad we had to leave! But it just encourages me to plan another adventure. Thank you so much for being a part of such a special trip! We had a wonderful stay here. The views were amazing. We spent Father’s Day weekend here and our family had a great time!! A wonderful weekend. 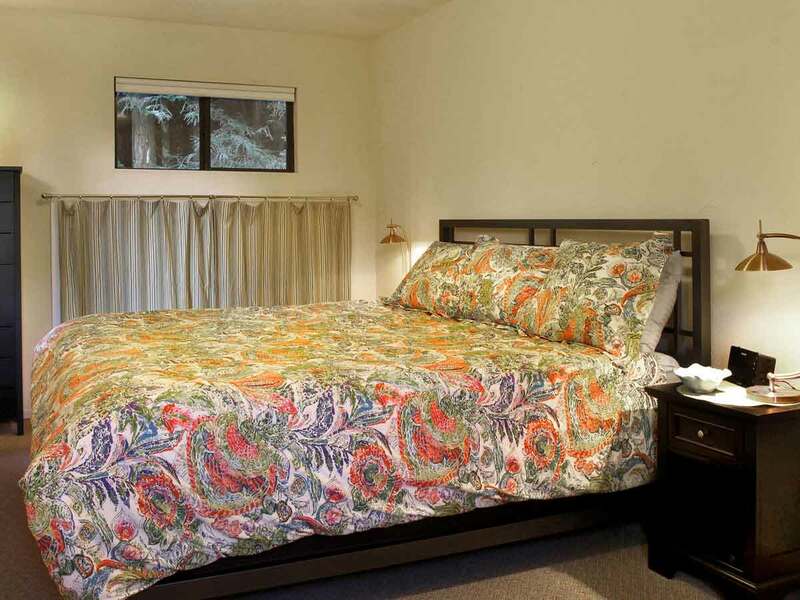 The house was had a beautiful combination of spacious bedrooms each with a king size bed and cozy living spaces. It was prefect for our weekend reunion of three friends + our families. Kids loved the outdoor spaces, the river, the foosball table. The fenced on yard was great for our beagle. Adults loved the hot tub and the well stocked kitchen. Really this house has all the things. Highly recommended.
" 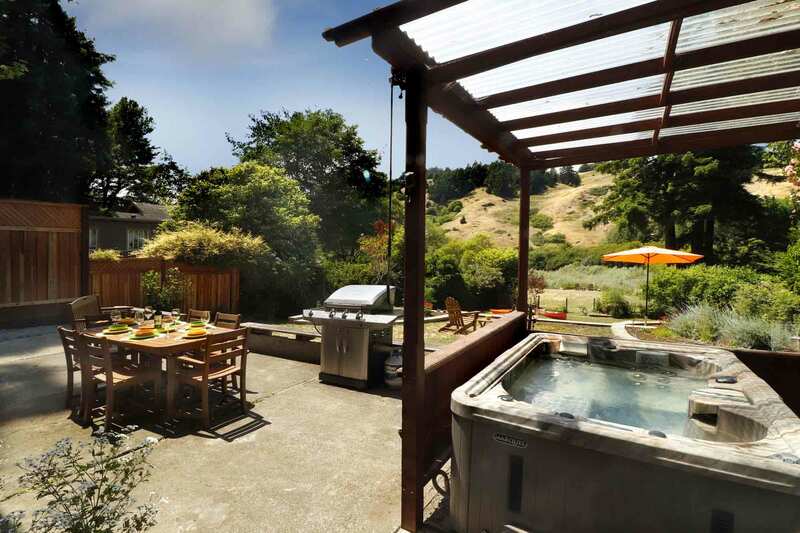 It was a perfect getaway"
Great house, great management group, and incredible location on the Russian River, only a few miles in from the coast. The house is rustic but super clean and with beautiful views down to the river, and a large patio and secondary coffee table and chairs on the riverbank to choose between. We stayed with a group of 6 adults and one 2-year-old baby, and we all had as much space as we could possibly want, and a kitchen big enough to fit all of us cooking and talking. The house is quiet enough that we were able to play boardgames at full volume downstairs without waking the baby, and there was no noise clash between early and late risers. It was a perfect getaway. Everything is just as pictured at Happy Trails...and that is saying a lot. 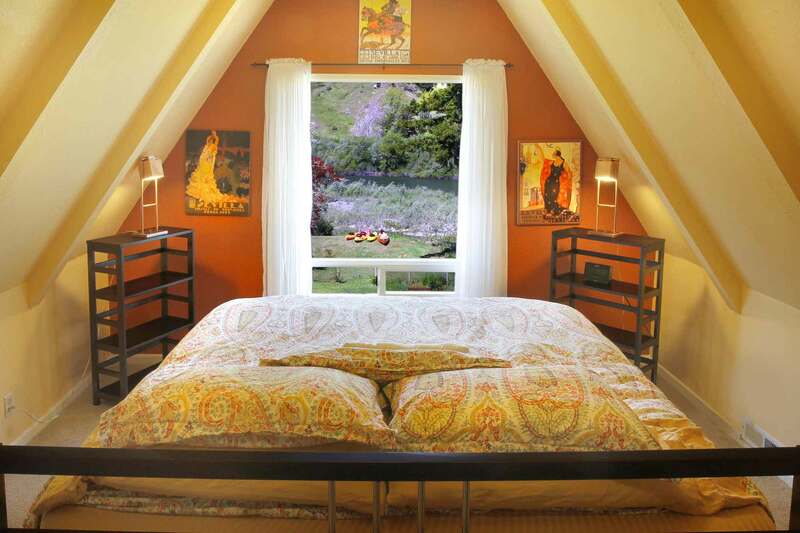 We felt as though we had a very private and beautiful slice of California wine country right out of our windows. The view is incredible and completely unobstructed. We enjoyed the living room, chairs by the river, and other amenities so much that we rarely left during our stay. This is the second time I have rented with River Getaways--I completely trust them to be there if anything is needed. There is excellent communication with any question you may have. I highly recommend this home and hope to be back some day. "We had the most incredible time at Happy Trails"
We had the most incredible time at Happy Trails. The house was big and beautiful with a huge yard. We enjoyed the hot tub, BBQ, river access, and views in the morning. Would absolutely love to come back again! It's awesome to hear that you enjoyed Happy Trails, Caroline, and we do hope you'll be back! Thanks for the great review! "Wonderful house on the river"
Just what we needed, what a lovely place! We enjoyed our long weekend away. 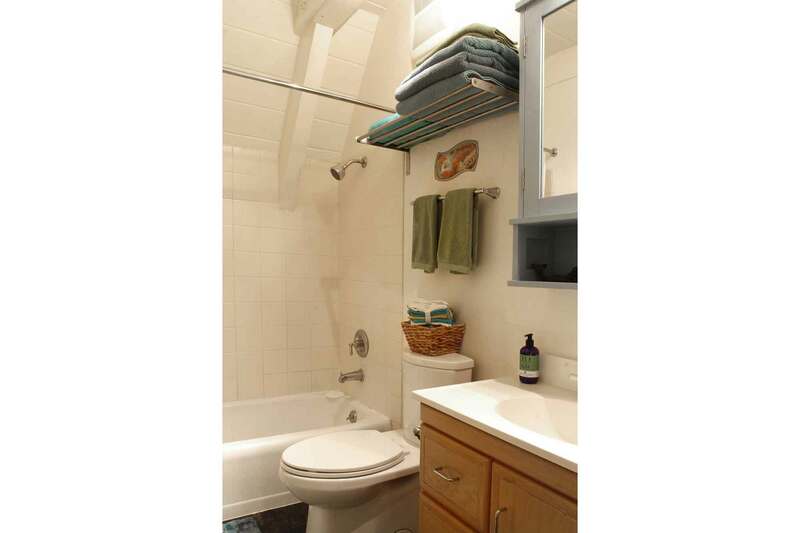 The house was ideally located and had many amenities. I do wish their was air conditioning but we made due. We would definitely consider coming back. "Beautiful property in a secluded area..."
Beautiful property in a secluded area, our family greatly enjoyed the stay there. The setting looking over the river and hills and nestled into the redwoods was breathtaking. The house was very comfortable, although the bathrooms (except for upstairs one) could use some refreshing, as could the carpet. The kitchen was very well appointed, with all the supplies we needed to cook delicious meals. One thing to note: those coming in the summer should be aware that the property is quite close to the coast, so it can be cool and overcast, especially in the morning and evening. It typically will not get over 70 degrees, so don't expect super hot summer weather. Thanks to the hosts for sharing your lovely home! "This gorgeous house is in a wonderful location..."
This gorgeous house is in a wonderful location, delightful views from the sitting room and very clean. We so enjoyed the space, the views, the kayaks, the hot tub, the surrounding area and dining outside in the garden and were thankful for a fully stocked kitchen, the kids were pleased there was a waffle maker. Great place to relax with the kids and grandparents and an enjoyable home to come back to at the end of the day. My parents enjoyed waking up to an incredible midnight sky full of bright stars from the front bedroom. A fantastic place to stay. Beautiful setting! 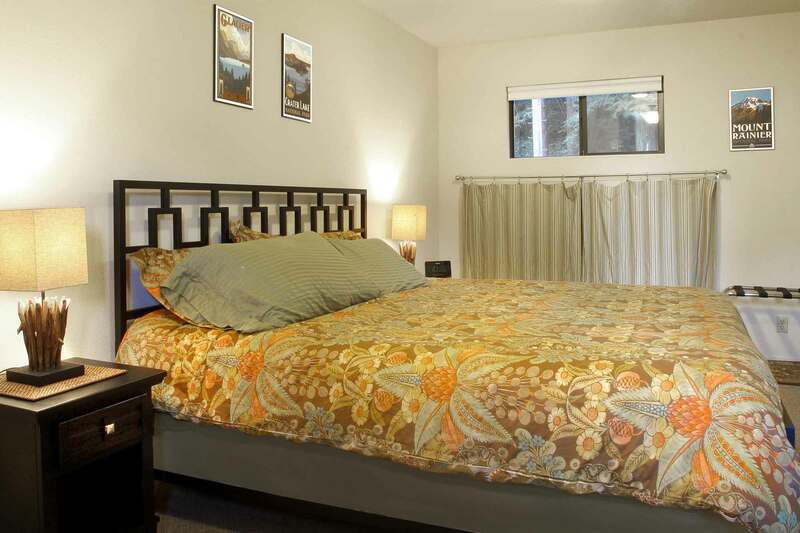 Comfy beds, fully stocked house. Loved the hot tub and river (and boats provided). The only downside was the smell of urine on the carpet downstairs. The house clearly has a lot of dog visitors. "The home, location, and setting are lovely..."
Comfortable home with lovely living room view of the river and ready river access. Fenced-in yard great for dogs. Kitchen very well stocked for cooking. The place was awesome and perfect for our two families, 4 adults and 2 kids. Everyone in our party was extremely happy about the place! The kitchen, living room, dining room layout was perfect for socializing and entertaining with plenty of room for the kids to play and move about. 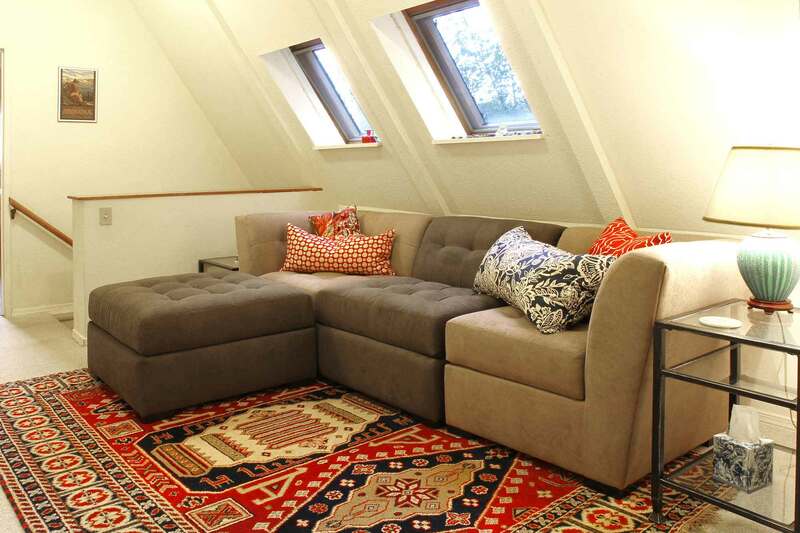 The upstairs bedrooms were wonderful with a bonus sitting/playing area for the kids. The place was clean and well prepared for our arrival. Communications prior to the stay was perfect. The kitchen had everything you could want for cooking and eating as well as plates, cups, and utensils for the kids. There were even toys and books for the kids. The overall layout of the house was great along with the beautiful view of the river and hills beyond. The location of the place was perfect as well. Walking distance to general store, bakery, tavern and other shops. A short drive to additional shops and other parts of the Russian River. The house is on the River and felt very secluded. We saw lots of animals including a bald eagle, a bob cat, egrets, and loads of cows. We'll have to return in the summer when it's warmer and we can take the boats/kayaks out into the river. This place is simply marvelous! Adored this little cottage with a big, gorgeous view and fenced yard for my dog! As usual, RG did an excellent job of providing a clean space with well-communicated directions for amenities and doggie bowls and toys for Biscuits Jackson - she is a huge fan of theirs! The hot tub was a huge success with my guests and we had an amazing weekend hanging out. "Great house in a great area!" This house is a treasure. We enjoyed having the fenced yard for the dogs and being on the river. The neighbors are close but polite. Access to the river is for people with good balance. There is no dock. We were fine with it and the supply of canoes/kayaks was much appreciated. The house is well stocked and very comfy beds. We would definitely rent it again. We LOVE Duncan Mills! "Happy times at Happy Trails"
This is a fabulous property. I highly recommend this rental home. 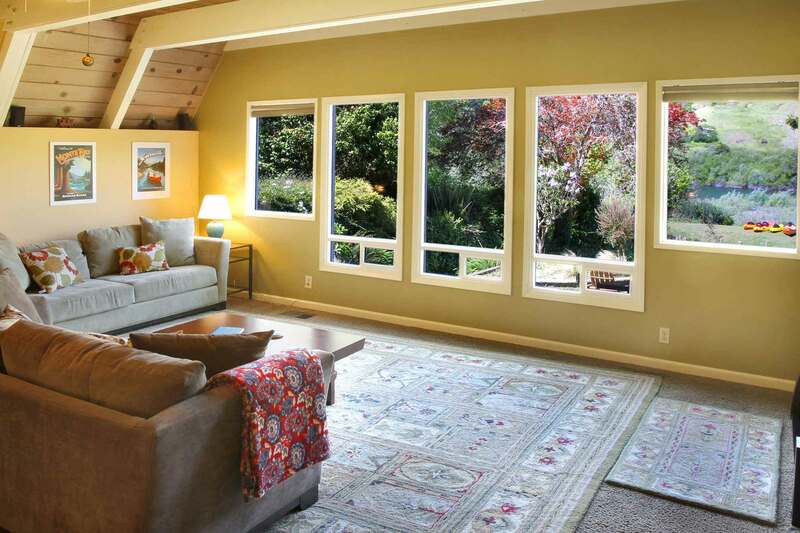 The house has a spectacular view of the Russian River. You will not want to leave once you get here. There is hiking and fabulous bicycling right out the door. There are three kayaks and a canoe for exploring the river or fishing. World class wineries are a short drive away. The beach (Jenner) is only 5 miles west. When the day ends, jump in the hot tub that looks out over the river. It was a joy to walk through the front door and see such exquisite upscale home comforts. 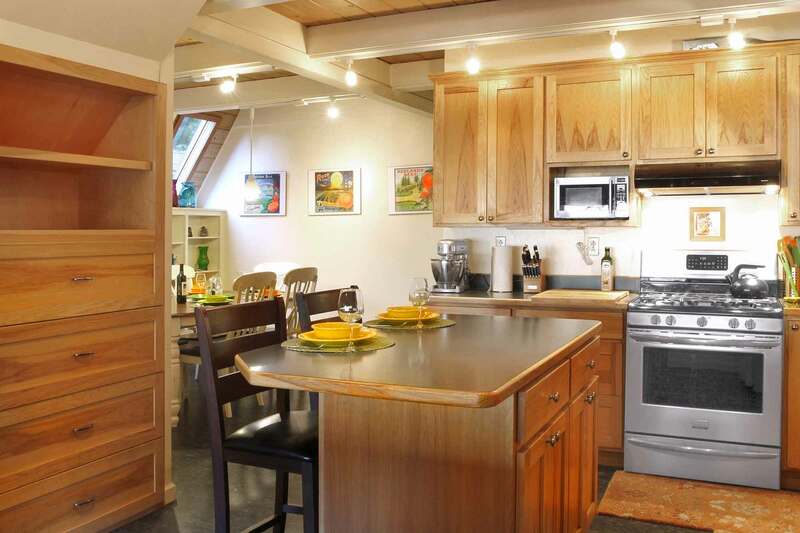 The kitchen is well equipped, the bedrooms and bathrooms are spacious. The three king beds are very comfy. The large back yard is great for playing, lounging on the deck chairs or swimming in the river. The house has lots of books and games for all ages. We thoroughly enjoyed staying here and cant wait to return. "Wonderful week in wine country!!" My husband and I spent a wonderful week at Happy Trails! 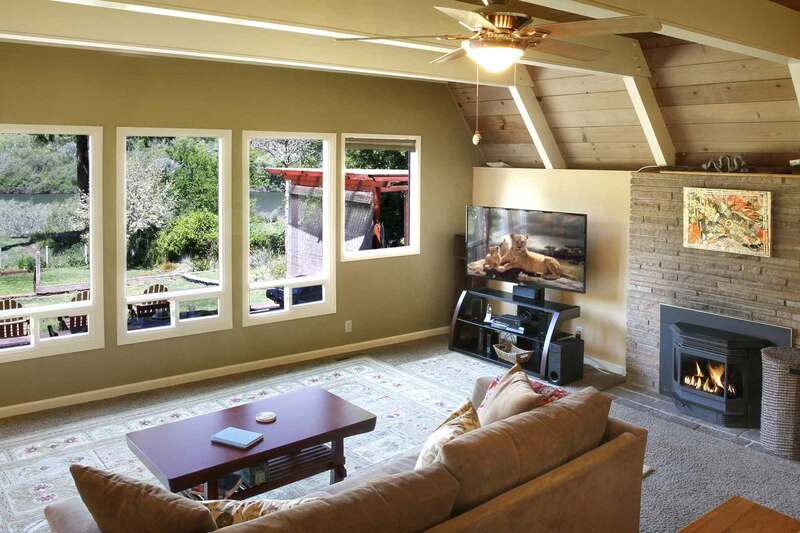 The house is located close to both the coast and wine country, so there is no shortage of things to do and explore. We were also an easy walk away from the town of Duncans Mills, where there are shops, restaurants, and a cafe with insanely good cinnamon rolls! Happy Trails itself is lovely both inside and out! The kitchen is very well stocked (honestly, Ive never seen a better one in a vacation house), so we were able to enjoy home cooked meals during our stay. 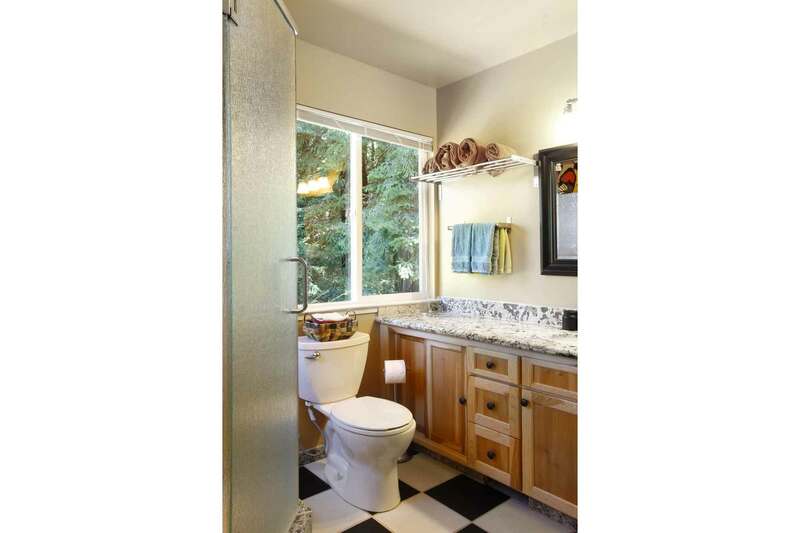 There is a beautiful brand new bathroom upstairs, which makes two full bathrooms inside, as well as one outdoors. We enjoyed sitting on the patio or in the yard reading and enjoying the river views, and my husband had a great time going out on the river in one of the kayaks provided. At the end of each day, we relaxed in the hot tub, savoring the cool breeze and those gorgeous views! My family and I stayed here, along with my father-in-law, for two nights after spending Thanksgiving with my mother in Santa Rosa. The house was comfortable, tastefully decorated and spotless. 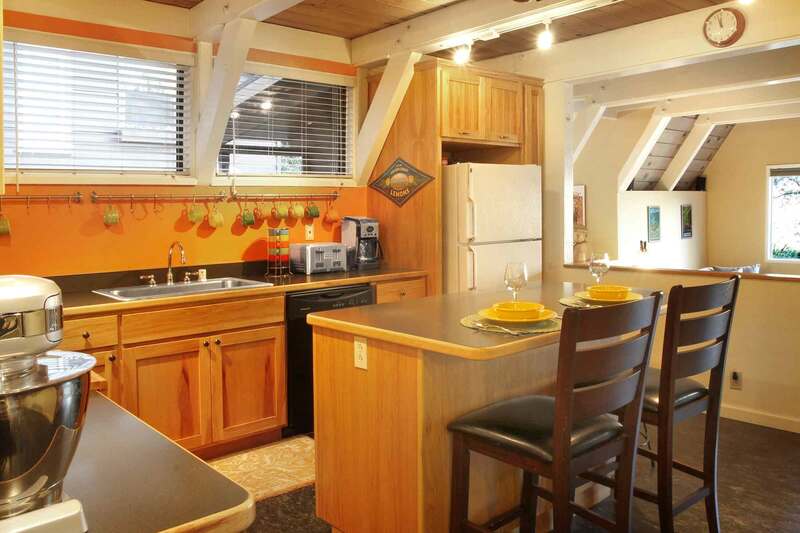 It has a wonderful view of the river, and kayaks and a canoe in the garage (which we did not use). We spent our day hiking in armstrong Grove, about 20 minutes away, and drove from here to the coast afterwards. The 6 of us slept comfortably. The only minor negative was that the only bathrooms were downstairs, while the bedrooms were all upstairs. Oh, and the addresses on the street are out of order, so it's a bit hard to find.